Description: ESD solvent dispensers are the perfect way to dispense alcohol, ethanol, methanol, acetone, isopropanol, terpenes, thinner or any other liquid applied with swabs or wipes. Features: ▪ Leak-proof precision pump valve prevents content vaporization and backflow. ▪ Stainless steel hinged cap lid keeps out impurities when not in use. ▪ Body is made of HDPE or glass with ESD material, it’s ideal for use in EPA and cleanroom environments. 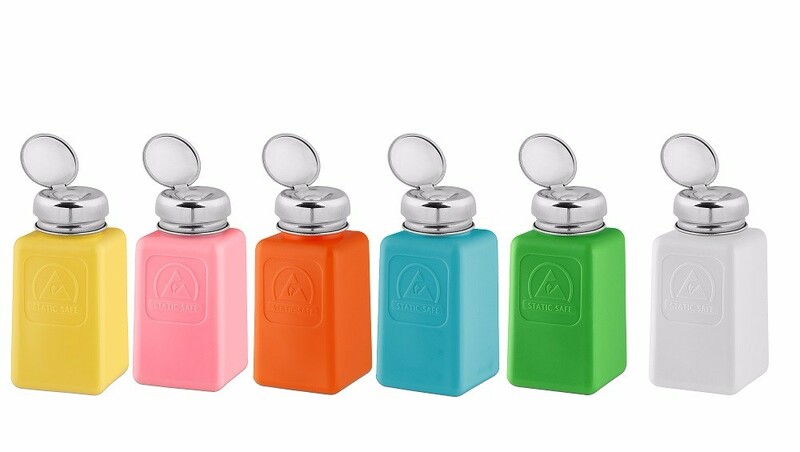 ▪ Volume options: 90ml,120ml,180ml, 250ml ▪ Colour: Pink, Blue, Red, Yellow etc. ESD solvent dispensers are the perfect way to dispense alcohol, ethanol, methanol, acetone, isopropanol, terpenes, thinner or any other liquid applied with swabs or wipes. ▪ Leak-proof precision pump valve prevents content vaporization and backflow. ▪ Stainless steel hinged cap lid keeps out impurities when not in use. ▪ Body is made of HDPE or glass with ESD material, it’s ideal for use in EPA and cleanroom environments. ▪ Colour: Pink, Blue, Red, Yellow etc.